A new politics of autonomy has arrived. On the one hand, imperatives and strategies for reducing autonomy are growing by the day. Public services are increasingly coercive, where people refuse to act in a way that will increase their health or wealth. Rights are becoming housed in our bodies rather than our minds, as biometrics become the means of accessing services. On the other hand, we see an assembled group of autonomists—religious factions, businesses, libertarians, binge drinking hedonists—who assert their right to select a lifestyle. Set in contrast to biological and sociological expertise, the demands of these latter groups come to be appear irrational, quaint or plain wrong. The worry is that without any fundamental reason to respect individual and collective choices, democracy itself will become tarred with the same brush. Tonight I'll be sleeping in Parliament Square as part of this protest with the Refugee Council, about government policies which consign asylum seekers to destitution. If you're interested in this issue, you can read all about it here or to sponsor me (money going towards the campaign) drop me an email. I think the last time I slept rough was in a quarry in Canterbury when I was 17, and that was something of an accident, so I have no idea what to expect. If my fingers don't seize up from the cold, I'll take some snaps and post them up tomorrow. 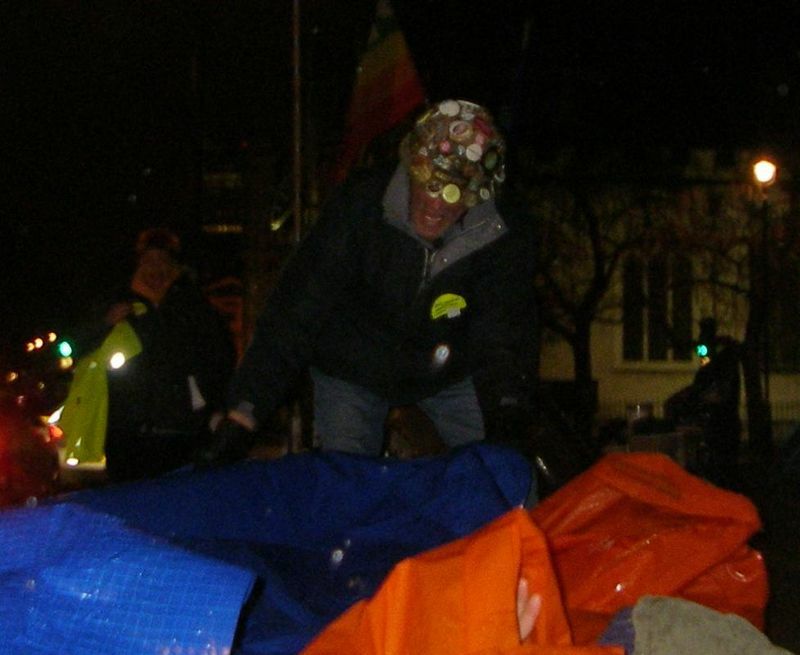 What I hadn't anticipated about sleeping in Parliament Square was that we were effectively guests of legendary activist and recently Tate-endorsed artist, Brian Haw. Like any good host, he seemed concerned about the weather, and this picture shows him taking time out from barking into his megaphone to tuck us all up in bed. A true gent. (Further details and photos of the night are here). I thought it must have been the first time I'd ever heard the word "hysterectomy" on Radio 4 when it wasn't Woman's Hour, let alone said by a newsreader, let alone in connection with a member of the royal family. Camilla Parker Bowles is to have a hysterectomy. As one correspondent posted to the Times website: "Why on earth would we be told that?" But then browsing the Guardian today, I came across two very prominent cases of the same phenomenon: Anita Roddick has 'revealed' that she has hepatitis C and Tony Wilson has 'revealed' that he has cancer. What on earth is going on? Not that long ago, these 'revelations' would only be made when they concerned the murky nexus of psychological and biological behaviour, the no-mans-land between mind and body, subjectivity and objectivity. The most obvious case of this would be where a celebrity outed themselves, but it would also encompass forms of mental illness or addiction. These events would create a frisson amongst tabloid readers, the implication being that the chemicals or hormones rushing around a celebrity's body might go some way to explaining their latest public utterance, song, policy or what have you. Perhaps the mind/body dualism might even be on the verge of dissolving, then just think what forms of racist or other prejudice might enter the ascendancy! It's for this good reason that Enlightenment liberals across the rest of the media treated such stories with a fair amount of disdain. The game now appears to be up. Chemical and biological events in a celebrity's body are now deemed to be matters of public concern, in the same way as the patterns of one's irises and finger prints will soon be determinants of national citizenship. In fact I can't help but wonder how much the bird flu epidemic is news-worthy for reasons of human risk, and how much it is simply the nation's latest favourite biological soap opera (not to be confused with biological soap powder). Mind and body are no longer plausibly separate entities in public discourse, and the media no longer hover only around their intersection. They have a free reign to swing wildly between the cultural, the psychological and the biological. If illness can be newsworthy thanks to the prior cultural achievements of the patient, how long can it be before some cultural contribution is deemed newsworthy thanks to the prior illness of its author? One can imagine the opening credits of a film: "the director of this film was once in a coma", a means of injecting new intrigue into tired public events. Lost in this melee is any sense of why we might be interested about these people in the first place, and what role their bodies ever performed in that, while subjectivity or agency recedes ever further into the background. I was going through some things the other day, and came across this scrap of paper that I found on Stepney Green tube platform a few years ago. 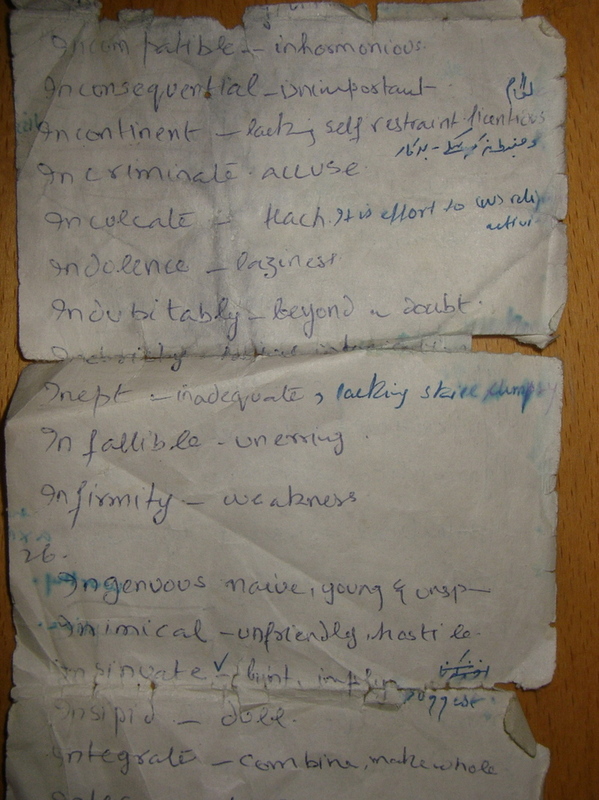 It appears to be part of a home-made dictionary or language-learning tool (there are some scribbles down the side in a script I don't recognise). I don't think a Wittgenstein or Benjamin could do more to capture the magic and sadness of individual words. Most movingly of all, I had by chance stumbled upon the page of words beginning 'in', making up a list of the various traits that can be lacking in life, some blurred by puddles from the platform. A fragment in every sense. JG Ballard saw this one coming in Millennium People: Britain is being rocked by Automobile Fundamentalism. Last week we heard worrying evidence of a bombing campaign against various bodies responsible for regulating and charging for road use. This week, the Downing Street e-petitions service has made headlines, thanks to a petition against road-user charging with excess of one million signatures (the second highest petition has a mere 48,000 signatures). With so many motorists drawn to the site, it is no surprise perhaps that recent new petitions include 'Remove the MOT' and 'Replace Traffic Wardens'. Thanks partly to the career-saving efforts of Jade Goody and Gordon Brown, Britain is currently going through another of those 'who are we?' type national therapy sessions that has become familiar since September 11th, and more so since 7/7. Is the answer now not staring us in the face? We're Alan Partridge. Napoleon may have goaded us by calling us a nation of shopkeepers, Thatcher may have attempted to turn us into a nation of shareholders, while the entire broadcasting industry appears to believe that we are a nation of obsessive home-owners, but only the car seems capable of enabling that critical tipping point between idle fetishism that characterises ownership in general, and political mobilisation. During the last US presidential election, Robert Putnam mused that the contest was between the capacity of fundamentalist churches to turn out the Republican vote and that of black churches, secular civic networks and the internet to turn out the Democrat vote. Other groups, such as the elderly and Hispanics, are courted furiously by both sides. Apart from Michael Howard's fateful and horribly racist campaign in 2005, which banked entirely on people caring enough about immigration to ignore everything else, UK politics has not yet conformed to this model of interest groups being wooed and then totted up by parties from both sides. Many predicted that it would arise once class-based politics dissolved, but instead, class-based politics just dissolved. Until now. My guess is that the government will find a way of ignoring this petition, as they found a way of ignoring opposition to top-up fees. But in principle, they ought to see this as a symbol of the 'Britishness' and civic activism that they idolise. American democracy put ownership of land at its heart, sanctifying the right not to be taxed without one's consent, from which other rights then stem. It has been nothing if not vibrant ever since. Perhaps, after our revolution, Britain will become a 'car-owning democracy', in which the car becomes the safeguard of all the other rights that British people care passionately about - the right to shop conveniently, the right to have no interaction with strangers, the right to listen to exactly one's preferred choice of music, the right to live in Surrey and so on. Following my talk at yesterday's UCL conference, 'Privacy, Equality and Security' (the second leg is on 23rd Feb incidentally), discussion turned towards the philosophical terrain of what do we consider a human being to be, if it is to be the possessor of certain rights. I had proposed that liberalism would not be able to provide a defence of civil liberties for much longer for two reasons. Firstly, in allowing itself to be characterised as 'the civil liberties argument/lobby', it has lost its universalist ambitions in favour of targetted campaigns. Secondly, biological accounts of the mind, will, freedom and identity are ousting the credibility of the transcendental accounts on which enlightenment liberalism depends (maybe the fact that I am reading Nikolas Roses's Politics of Life Itself at the moment made me unduly pessimistic on this latter front.) This is in addition to the fact that the UK government is at best uninterested in rights-based arguments. But perhaps the question is not how dependent our polity is on the dependence of rights - the sad answer is, it isn't - but how dependent our economy is. On the face of it, this is familiar terrain. After all, Marxists have always viewed human rights as a somewhat elaborate legal defence of the freedom of workers to sell their labour, and thereby exploit themselves. And Will Hutton's recent argument that China's economy will at some point require an 'enlightenment infrastructure' to butress it is pointing in a similar direction. I'm thinking about something subtly different, however, that may come down to transaction cost economics. - Consumption: I bought this alcoholic drink and you sold it to me; but you should have been aware from your data that I am an alcoholic, and I therefore hold you responsible. - Employment: already, mental illness provides managers with one of their biggest challenges. When people take long-term sickness for mysterious reasons, how to react? Human beings are shedding more and more responsibility for their behaviour, and becoming increasingly literate in biological analysis of why they have behaved as they did. In place of protest ('I refuse') comes passivity ('I can't'). How should managers respond when staff are absent for complex mental reasons that they claim to have no control over? Obviously, the immediate solution will be to increase biological and mental screening of staff, but this is expensive and inefficient in many cases (I'm deliberately ignoring the normative reasons for not doing so). So my question is - at what point does it become more efficient to presume and bestow subjectivity upon an individual? This might take the form of asking them to sign something, agreeing that they hold responsibility for their behaviour, genes, mental processes and bodies. But then what was subjectivity in the first place, if not that? If, as Marxists claim, liberalism is a bourgeois philosophy, it is not implausible that it will be reinvented in the future, once the weight and complexity of biological evidence starts to over-burden the individualism on which capitalism depends. Consider how professions nowadays still retain an important role in the market, despite having lost the more metaphysical 'vocations' which used to define them; it is because trusting someone's judgement is actually more economically efficient than resorting constantly to insurance companies. We might at some point discover that there is an important economic case for respecting the integrity of a human being... or at least, some human beings, and therein lies the politics. Gifts are performative contradictions. As soon as you give someone a gift, you are locking them into a relationship in which there are norms of reciprocity, which means exchange, which means no more gift (this post by Kevin Harris got me thinking about this again). This is why Derrida said that the only genuine gift would be paying for something with a fake bank note: the recipient has unknowingly received something that is unexchangable. Insults are also performative contradictions. As soon as you call someone a [insert rude word], you are ritualising the insult, erradicating any genuine hurt that it might cause, and simply inviting a return insult of the 'take a look in the mirror!' variety. In this respect, "adding insult to injury" might almost make the injury more tolerable, in contrast to a silent punch in the face. But it occurred to me that there might be an equivalent of the fake bank note for insults: the phrase "you take criticism really badly". The recipient is left with two strategies. They can agree, accepting the insult but thereby failing to reciprocate it or cancel it out. Or they can get annoyed, reciprocate the insult, thereby confirming its higher truth. Contemporary policy discussions tend to become most impassioned and most exasperating when they touch on those issues which lie at or just outside of the limits of policy. Anti-social behaviour, parenting habits, social capital, SME activity are all cases of this. Policy-makers take up the position of a man who has dropped his hat in a canal, and strains desparately to reach it while trying to maintain a stable position on the bank. It's necessary but perilous, and you look stupid when it doesn't work. If you fall in, the chances are that the hat will simply float even further away (e.g. ASBOs becoming badges of honour). In the case of the media, most people take the view that the hat has long since floated away, well beyond the reach of even the most agile politician. But if you don't take this view, it is fairly likely that you subscribe to one of two policy programmes: 'The Media Literacy Agenda' or 'The John Lloyd Agenda'. To put this in somewhat crude terms, this breaks down to a simple choice - more relativism or less? Britain must be rare in possessing an official media literacy agenda, housed in the communications regulator, and installed according to the sound Foucaultian principle that if we are entering an age in which the State can't control the media, then it should produce forms of subjectivity in which people can regulate their own consumption of it. The answer is to produce a nation of keen young postmodernists, who treat all information as suspect, and are able to locate it within the strategy (possibly even within the political economy) of its distributor. As long as nobody believes what anybody else says, then we're all equal. In this sense, Nietzsche's dionysian dance away from the confines of 'truth' now, somewhat brilliantly, forms a central plank in UK media policy. The John Lloyd agenda, meanwhile, is akin to the Critical Realism which emerged in the 1970s as an alternative to the relativism that was sweeping philosophy of science. Lloyd's book and Institute are founded on the notion that there is such a thing as reality, and that we can either chose to reveal it or to conceal it, but that the media have made a habit of doing the latter. My fear with this philosophical programme is that it reduces the media to a popularised outcrop of social science, flooding the public sphere with some dry collection of facts, and belittling the doxa (opinion) that Arendt saw as the basic currency of public discourse. What both of these miss (the second more than the first) is the importance of inter-mingling truth and opinion as a testimony to who we are as a society. This occurred to me earlier on today when I was struck by the following thought: what does Tony Blair think the world is like? His sources of information and opinion about it would be actually quite limited: civil servants (who communicate increasingly via Powerpoint regardless of whether a presentation is involved), carefully screened academics who give internal seminars, advisors who no doubt read books occasionally, and the intelligence services. Where crucial decisions are at stake, you can probably whittle that down to just advisors and intelligence services; rumour has it that the favorable position Blair took towards Israel's bombing of Lebanon was adopted in consultation with Jonathan Powell only. Meanwhile, Blair would only look at newspapers in the same way as a singleton would study their online dating profile: to find out who likes or hates him that day. There would be no information to be gleaned, no analysis of poverty that could trump that of his favoured academic, no reports on the Middle East that could be more authoritative than his Generals, no rumours of extremism that were more trustworthy than his intelligence staff. Curiously, this puts Blair in a very small and impoverished section of society - those who consume no news media whatsoever. These people benefit and suffer in equal measure. They don't suffer the delusions of those tabloid readers who believe that Britain is flooded with immigrants, and they are not troubled by the unrelenting negativity of much print media. But at the same time, when the cost of their mortgage goes up, they have no idea why, and the world must be a constant source of mystery. These people live in a world that is more fact-based than the rest of us, but at the same time have less knowledge; they are less likely to be deceived, but also less likely to understand. Their dependence on experience makes them, in the literal philosophical sense of the word, empiricists. Lacking the orientation of public discussion and multiple representations, they act on the basis of things either happening or not happening. Sometimes, as with WMDs, things can flip disastrously from one status to the other. I am in the fortunate position of being both media literate and having access to non-(mass)media representations of society, thanks to my academic research. If John Lloyd were right, I wouldn't read the newspaper every day, but I do, and have a feeling that this indicates something quite fundamental about politics and something quite fundamentally wrong about New Labour (of whom Lloyd has been an outspoken supporter). Idea for a research project: what do those people who consume no news whatsoever think the world is like? Broaden the geographical and temporal scope of this by around 1000-fold, and you may get a glimpse inside the head of a Prime Minister.